OC Air Show is Here! As a kid you want to fly. Then you grow up and, well, you still want to fly. We all want to fly. To defy gravity. To feel that weightlessness of flight and thrust ourselves towards the sky and to belong among the creatures that own it. Flight is bringing science, imagination and crazy together to create nothing short of magic. It’s a bird, it’s a plane, it’s… the Ocean City, Maryland Airshow! This weekend, if you’re in town, make sure to look to the sky, because there will be a aeronautical display of tremendous proportions, and you don’t want to miss it. Before we dive head first into this weekend’s splendor, let’s rewind time for a moment and mention a couple of brothers. A couple of brothers named Orville and Wilbur. On a cold, windy day in Kitty Hawk, NC these two men defied gravity. They used some spruce, fabric and ingenuity to invent a machine like the world had never seen before. The Wright Brothers thrust themselves headfirst into flight for the first time on December 3, 1903 and we’ve never looked back since. The above photo documents that day. From Amelia Earhart to Howard Hughes to the Red Baron we’ve come along way since, but none of those names would hold importance without the Wright Brothers. 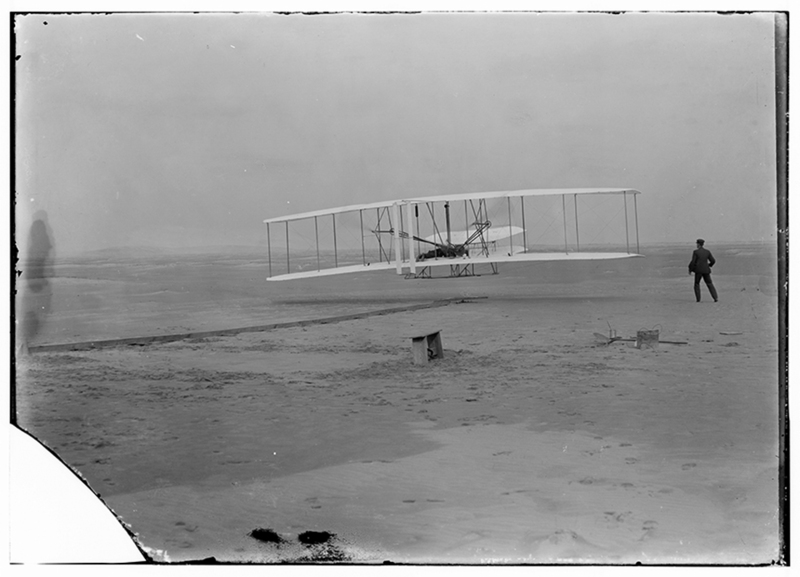 Thank you Wright Bros.
Now onto this weekend… a weekend that is sure to thrill. The epicenter of the OC Air Show is 16th Street, but if you’re anywhere in Ocean City, MD you’re bound to catch spectacular planes of all varieties. The OC Air Show will commemorate the 70th anniversary of VE-Day (victory in Europe, WWII) and there will be B-25 Bomber and P-51 Mustang tribute flights. A descendent of the Mustang, the F-22 Raptor, billed as ‘the most advanced fighter aircraft in the world,’ will also be on display. There will be trick planes, full loops, flybys, paratroopers and general aeronautic hotdoggery. To top it all off the U.S. Navy Blue Angels will be there performing both days! View the following: OC AIR SHOW for a complete list of events and the full schedule. What more can we say, grab the beach chair, some sunscreen and look towards the heavens this weekend! Oh yeah, sun glasses might help.